The University of Texas at Austin (UT Austin)’s Class of 2018 achieved the highest graduation rate of 69.8 percent for a four-year program in the university and of any public university in the state during the recent academic year. 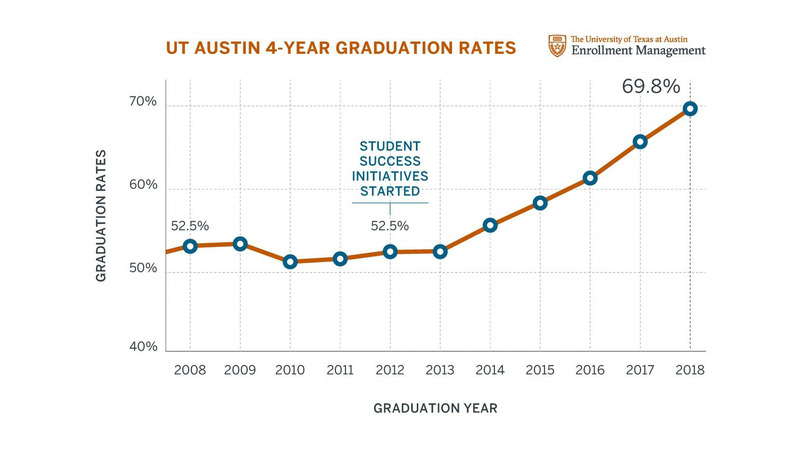 UT Austin’s record of four-year graduation rates from 2008 to 2018, courtesy of UT News. 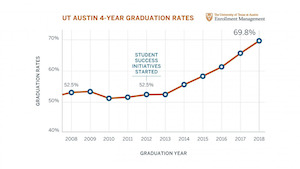 Among the percent of UT Austin’s most recent graduates, a record number of minority, first-generation and Pell-eligible students graduated in comparison to its Class of 2012 graduates. The percentage of first-generation students who graduated in four years increased from 40.9 in 2012 to 61.5 percent. The percentage of Pell-eligible students who graduated in four years increased from 40.3 in 2012 to 61 percent. The percentage of Hispanic students who graduated in four years increased from 42.9 in 2012 to 63.7 percent. The percentage of African-American students who graduated in four years increased from 36.6 in 2012 to 58.4 percent. The institution credits its improved graduation rates to new student success programs and new ways to analyze student data.